Sites #40-76 only. Sites #80-100 opening soon! Sites #1-38 still drying out. No monthly sites available at this time. 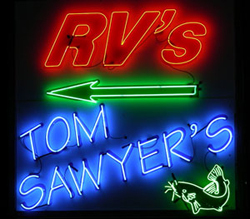 Tom Sawyer’s is only a few very convenient miles on a smooth, new road from both I-40 and I-55 as well as 10 miles from all the great action in a resurgent Downtown Memphis or 20 miles from Graceland if you’ve never been! Our RV sites are easy access pull-thrus with 30 or 50 amp power, city water, and city sewer. We have over 3 dozen concrete sites and you can choose from the shade of the woods or the edge of the river for your visit. In addition to our lovely motor home riverfront section, our 5th wheel riverfront section is designed so that the large rear picture window looks out over the Mississippi River. You can sit under your awning, which also faces the river, on the concrete pads and throw a rock in the water! So much is planned for the future you should keep coming back to experience our ever improving environment. We hope you enjoy your stay and always welcome suggestions for creating a more unique and enjoyable experience for our guests.